It’s time to finish this up good and proper, the final Telesys game, the only one I’ve yet to review. Demolition Herby was the final game Telesys released before packing up and vanishing from the videogame market altogether. This isn’t a very complicated game so I’ll give it a simple single paragraph review, though this may end up being a giant wall of text. This is an Amidar clone, it’s the same premise of surrounding a square to fill it in, or in Herby’s case, black them out. You are pursued by three vehicles, a tow truck, a bulldozer, and what I think is a squad car. All of the car sprites look very good and are multicolored to boot. These three enemies will doggedly chase you around the screen as you try to black out the squares, but they do far more than just harass you. After you drive over a line it will change color from white to red, if an enemy drives over a red line it will turn back to white undoing your progress. You can boot these meddling drivers off the road by rear ending them, I’d recommend using overdrive to get to them faster since they can turn around at the intersections. If you manage to boot all three vehicles off the road you’ll be allowed to fill in spaces while in overdrive which you couldn’t do before. To keep things from getting boring and to keep you moving along there is a fuel bar, you refill it by blacking out a square. 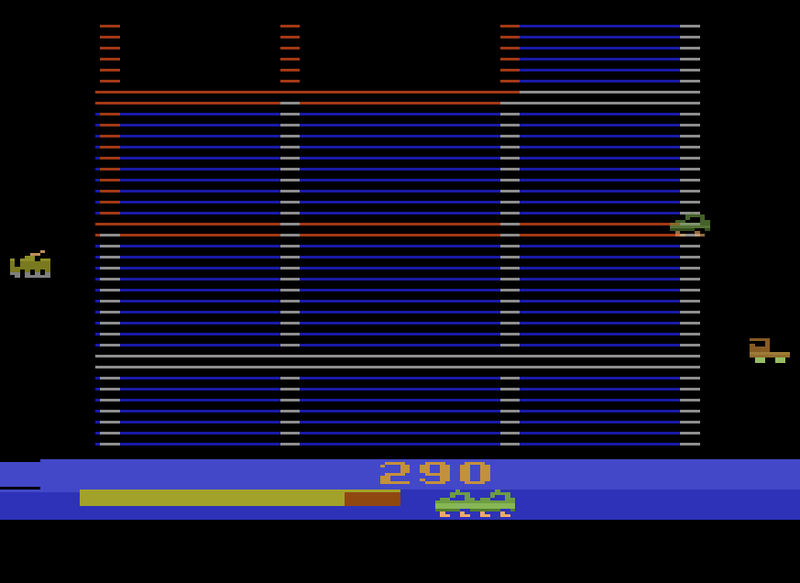 Graphically the game is about average, it’s basically Amidar with a large vertically scrolling map, but instead of having varying sizes of reactangle like in Amidar, Demolition Herby simply has a basic grid pattern which does make things a bit monotonous after a while. The main detractor from the graphics is the flicker, it’s about on the same level as Atari’s Pac-Man if not worse, you also cannot see enemy cars as soon as they are on screen they will appear about an inch from the edge which makes for some hectic moments. There are no noteworthy sounds, no music, and nothing but the most basic of beeps. Demolition Herby is in actuality a very fun game to play, as long as you have the enemies moving at their fastest. This game is much like Ram It in this sense as the easiest difficulty is also the worst representation of the game in action. Demolition Herby is a fast and fun chase game and is exponentially better than Amidar in most aspects and would recommend purchasing it any day. As this is Telesys’ final game the prices are all over the place and not in a good way. I managed to snag my copy with a slightly damaged label (color label handle variation) on Ebay for 20 dollars, which is the maximum price I’d recommend purchasing this game at. If you MUST own it now you can find loose copies on Ebay from 28-60 dollars, there aren’t any boxed copies up but if there is one you can expect to pay handsomely for it as the last one that sold went for almost 190 dollars. If you can get a copy for 20 bucks or less than I’d say go for it, otherwise it would be best to wait.